Concerns had been that funds for the government’s Rebuilding Ireland Home Loan Scheme have run out. A FIRST-TIME-BUYERS loan scheme has not closed and applications can continue, Housing Minister Eoghan Murphy has said, following concerns that funding has run out. TheJournal.ie reported on Monday that concerns had been raised that funds for the government’s Rebuilding Ireland Home Loan Scheme have run out. However, Murphy today said that “the scheme is not closed” and that “funding has not run out”. Under the scheme, a first-time-buyer can apply for a home loan to purchase a new or second-hand property, or to build their own home. First-time-buyers can borrow up to 90% of the market value of the property, with maximum market values set at €320,000 in the counties of Cork, Dublin, Galway, Kildare, Louth, Meath and Wicklow, and €250,000 in the rest of the country. Labour Housing Spokesperson Jan O’Sullivan on Monday raised concerns about a directive being issued to local authorities telling them to stop considering applications for the Rebuilding Ireland Home Loan Scheme due to funds for the scheme running out. 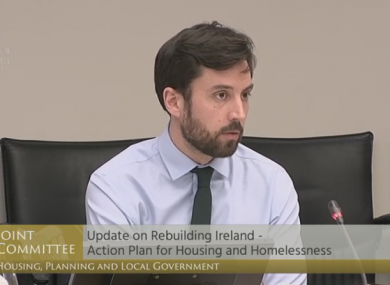 Murphy appeared before an Oireachtas Housing Committee this morning to answer questions on the progress of the government’s Rebuilding Ireland Housing Action Plan, launched in July 2016. However, members of the committee took the opportunity to quiz the minister on reports in recent days over the loan scheme. Solidarity-People Before Profit TD Mick Barry asked Murphy why the scheme had been “frozen”. “I say that it’s madness in the middle of the greatest housing and homelessness crisis in the history of the State that a scheme such as this would be frozen for any length of time,” Barry said. RTÉ reported yesterday that a Department of Housing internal document revealed the scheme had been put on hold because it had run out of funding. Senator Victor Boyhan said that “yesterday people woke up to Morning Ireland to listen to what would appear to be a crisis in terms of funding for this initiative”. “These are people who are just barely over the threshold. These are people that get up very early in the morning, who work all day, who want to provide housing for themselves,” Boyhan said. Echoing Boyhan’s comments, Fianna Fáil TD Darragh O’Brien said “there are hundreds of really concerned people out there right now”. “Their concerns need to be addressed and they need to be addressed very clearly,” he said. Addressing the committee, Murphy said he is “genuinely surprised how this was being reported yesterday”. The scheme is not closed, funding has not run out and I have been very clear on how this has been progressing. Murphy confirmed that the scheme is at about 50% drawdown, but said “if we look at the amount that have been approved, we’re almost at potentially a drawdown limit if that continues through into the rest of the year”. “The reality is the scheme will require more funding to be made available and that’s what I’m discussing with the Minister for Public Expenditure and Reform,” Murphy said. A spokesperson for the housing minister confirmed to TheJournal.ie on Monday that the Housing Department is currently in discussions with the Departments of Public Expenditure and Reform and Finance with regard to an extension of the scheme in this regard. “When the Rebuilding Ireland Home Loan was initially being developed it was estimated that the drawdown of loans under the scheme would be approximately €200 million over three years. “From the data collated on the scheme to date, the RIHL has proven to be more successful than initially anticipated, as a result of which, the scheme would require a further tranche of funds to be borrowed by the HFA in order to enable its continuation,” they added. Murphy said today that the Department has been “engaging” with local authorities who have reached their limit for the scheme and that some were given additional funding last year. To repeat, the scheme is not closed, funding has not run out and applications can continue. “Any loan approval that has been given will be honoured, of course it will be. Applications are still being received,” he said. Email “Murphy insists funding for first-time-buyer loan scheme 'has not run out'”. Feedback on “Murphy insists funding for first-time-buyer loan scheme 'has not run out'”.